Making this quilt as a Sew-Along gives us lots of advantages. We can choose our own colors, we save on postage and we have no deadlines. Remember, this is not a race. Sew at your own pace and please share your progress. We love pictures!!! Let's get started with the supply list, options and a little house keeping. I plan on posting instruction steps approximately every two weeks - total of seven steps - unless the group prefers something else. The block is 15 1/2" unfinished. The smaller quilt calls for 12 blocks and is 59” X 77” with no Border. The larger quilt calls for 20 blocks and measures 77” X 95” with no border. There are instructions for border options in the last set of instructions. You may make a 2-color, a 3-color or a scrappy version of this quilt. Lots of choices! I will post Step One this coming Friday, October 5th. I went to the site for the yardage but it says: site not found. I went to her site, but wasn't able to download anything. I'm glad you chose this quilt. I grew up in Saratoga and my grandmother was Saratoga County Historian. So I am quite familiar with this quilt. I have owned the pattern book for many years and the spine is not even cracked LOL. Perhaps I could get it done with this thread. Thank you Jane for choosing and hosting this sew along. Was in Saratoga last summer...history police here, Jane (LOL). It was the Revolutionary War, not Civil War. Thanks for starting this...going to get my reds ready and find a background fabric. oksewglad... since you quoted my post, I just assumed that I had made the mistake. Turns out it was not my error after all. Yep - - - Revolutionary War not the Civil War. I'm going to do mine in scrappy 30's. I think the trick is to have good contrast so I'm trying to choose prints that are strong enough to stand out to create the 'circle' and the chain part of the blocks. I'm anxious to see what others are choosing for your colors too. So I have to ask. Was the color catcher pink? I plan to do the same thing but with blues. Since both are notorious bleeders and the rest is white, what is the best way to wash them. I thing you did good. Even though, it's a mess. Hand wash? I used 2 color catchers and they are as red as the fabric! I also used Dawn dishwashing liquid as my "soap"--a couple of tablespoons. I checked the water during wash and rinse. As the rinse water was still pink I decided to wash again with Dawn. The second wash was when the zippers broke. The second rinse was almost clear so I felt the dye was set. i also included larger fabric pieces in the wash (close to FQ size)...not in the bags and they did not get too tangled up. It was the wof fabric cuts that suffered the worst. I had a large softball size of "strings" that were tossed. I will admit the bags were cheap (a package of three from the Dollar Tree) and a more reliable brand of bag might not cause a problem. I think it will be worth it to go through the wash cycle for your blues, toverly, but I would definitely use a better quality lingerie bag...check the zipper quality beforehand. Lesson learned, you get what you pay for. LOL, I would have gone with the dollar tree ones too. I have several. I will definitely prewash this time. Looking forward to the project. I'll in! I'll probably go scrappy and hopefully I can use up some of my strips. All my fabric has already been washed so don't have to deal with that at least. well- now I'm torn! I started looking at pictures for color ideas and love both with dark background and with light background! I am having trouble finding the pattern. When I click on the link, it takes me to her site; found the pattern on page 6 but I click on it the pattern does not come up - only a bunch of stuff that refers to it but no pattern. Does someone have a different link or can tell me what I am doing wrong? That's a gorgeous pattern. I'm in! and here is link to pattern and construction directions ..
oksewglad ..my red scrap pile is growing and this is one of the quilts i've thought about using them in. i wash my scraps too as most given by friends and some washed, some not. i don't use the laundry bags tho i bought some for that purpose. i use dawn and all the reds in supersize washer load of water. i also use color catchers ..for darks i use between 10-12 sheets. it really really catches all the stray dye. rinse twice even if first rinse clear. i also only hand agitate ..not machine agitate. this reduces amount of fraying threads and tangling of the longer strips of scraps. spin dry. Last edited by roguequilter; 10-02-2018 at 09:09 AM. If you use the link on 1st post and look down towards the bottom on the right side there is a list look for Burgoyne Surrounded and click on name and it should take to the correct post to click on. Hope this helps. We're starting here with the supply list. I will post the Step One on Friday, Oct. 5th. Any other questions, please let me know! I think it's a scrappy version of the Burgoyne Surrounded... isn't it? However, I found it was very time consuming (with all those tiny scraps) and always seemed something crossed on the way... so I let it aside, then time passed and I couldn't find the moment to start again. 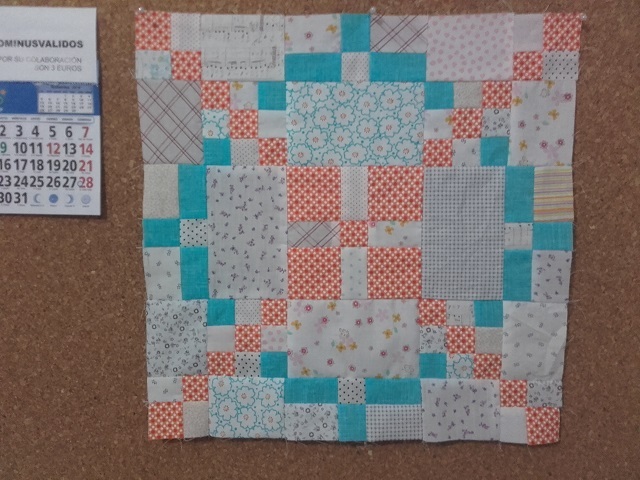 Every time I see the block hanging in the wall of my sewing room, I wish I could be able to advance... but I'm afraid I need some encouragement. If you let me join, this would be a great chance for me to continue. Of course, Silk! I will be posting the steps every 2 weeks, starting this coming Friday - - - total of 7 steps. You're certainly welcome to participate. We love pictures so to everyone - -- please post your progress. That block is so pretty, Silk! I really want to join in! I'm wondering how this quilt would look made from checkered cotton shirts. I think the pattern would make a great guy quilt. I can't wait to start, see you here this Friday! I'm sure I'll find the much needed inspiration reading your words and seeing your pictures. There are so many diferent possibilities with this pattern, this was what captivated me when I first discovered. I'm wondering how this quilt would look made from checkered cotton shirts. I think the pattern would make a great guy quilt. Wow, this is a very interesting idea! 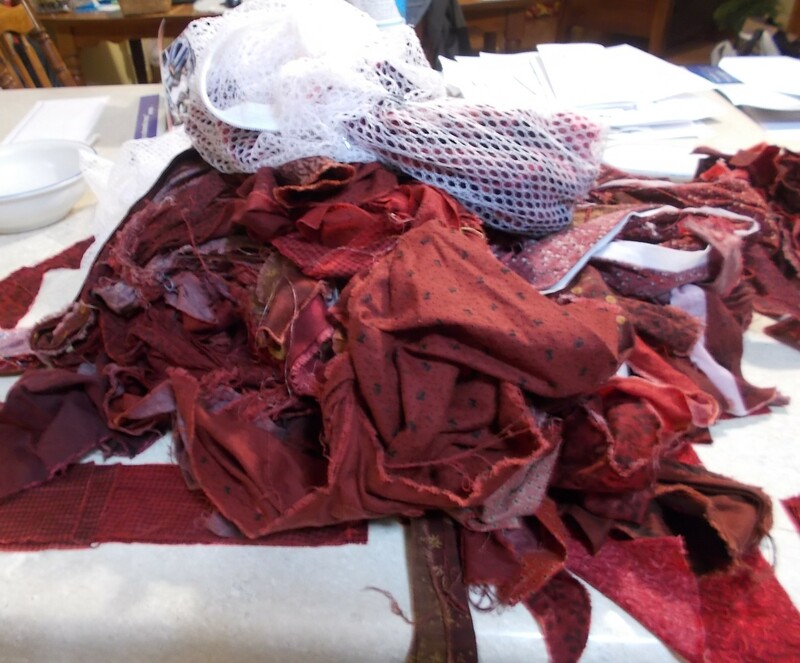 Hey roguequilter, thanks for the info on washing scraps. Dah I should've used my "delicate" cycle, something not in this farm wife's vocabulary I even had my scraps sorted into light and dark reds, and now have to re-sort! Not sure where to place the darks...essentially will have 3 color quilt. Looked for background fabric at work but didn't see any I liked unless I go with a small cream tone on tone. I've been using my light scraps in other quilts.